A beautifully engraved separate issue U.S. Coast and Geodetic Survey nautical chart of Beaufort Harbor and environs. 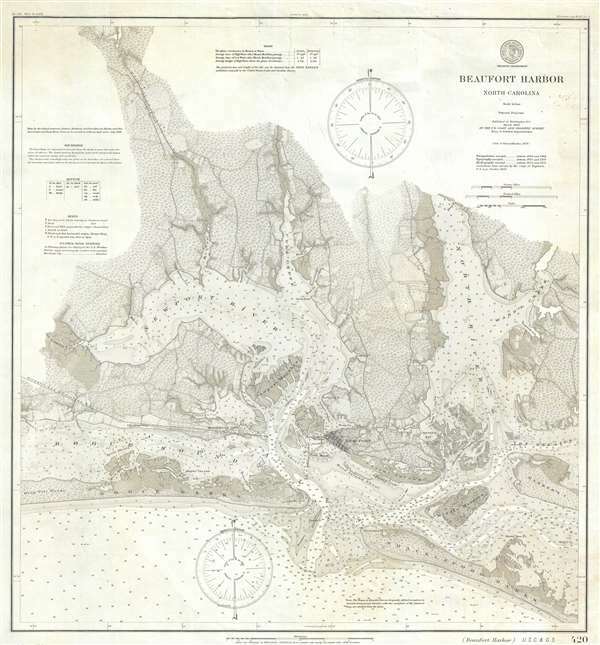 This is a separate issue 1900 U.S. Coast and Geodetic Survey map of Beaufort Harbor, North Carolina. The map depicts the region from Hoop Ole Woods and The Narrows to Ward Creek and Harker's Island and from Clubfoot Creek to Shackleford Banks and the Atlantic Ocean. Highly detailed, myriad depth soundings, measured in feet, are indicated throughout. Numerous islands, shoals, marshes, and other navigation hazards are illustrated, along with the Newport River, the Core Creek, the North River, and Rogue Sound. Both Beaufort and Morehead City are illustrated and labeled. The Atlantic and North Carolina Railroad is also preset, running from Morehead City off the left side of the map. The Clubfoot Canal, connecting Clubfoot Creek and Hart Creek, is also illustrated and labeled. Notes concerning tides are situated along the top border, while notes about soundings, buoys, and weather signal stations are included along the left side. This map was first published in 1876, and this example was published with updates and corrections in March 1900 by the U.S. Coast and Geodetic Survey while Henry Smith Pritchett was superintendent. Henry Smith Pritchett (April 16, 1857 - August 28, 1939) was an American astronomer and educator. Born in Fayette, Missouri, Pritchett attended Pritchett College in Glasgow, Missouri and graduated with a B.A. in 1875. He then spent two years at the U.S. Naval Observatory under the tutelage of Asaph Hall, after which he became an assistant astronomer. He returned to Glasgow in 1880 for a job at the Morrison Observatory, where his father was the director. In 1882, Pritchett served as an astronomer on the Transit of Venus Expedition to New Zealand, and was appointed as a professor of mathematics and astronomy at Washington University in St. Louis upon his return in 1883. While at Washington University, Pritchett also served as the director of the observatory. Pritchett studied in Germany in the early 1890s and earned a PhD from the University of Munich in 1894. From December 1, 1897 until November 30, 1900, Pritchett was the Superintendent of the U.S. Coast and Geodetic Survey, and then was president of the Massachusetts Institute of Technology (MIT) from 1900 until 1906. After leaving MIT, Pritchett served as the president of the Carnegie Foundation for the Advancement of Teaching from 1906 until he retired in 1930. Very good. Backed on linen. Light soiling. Close bottom margin. Blank on verso.